Modern Greek Level 1. Over the years, Audio Forum customers have used our courses to learn Greek in as little as 25 minutes a day, entirely on their own. You'll be amazed at how easy it is to achieve fluency in Greek using this proven audio/text method. 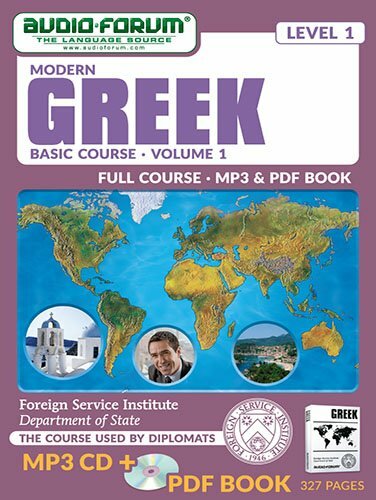 While other premium computer-based language courses offer only the means to learn to speak, with Audio-Forum, you'll not only speak fluently, you'll also master grammar skills at a scholarly level - all with the confidence and polish of a native Greek speaker. After all, diplomats have proven for years that this method works! The U.S. State Department's Foreign Service Institute developed full-length courses specifically for diplomats, the very people who must learn a language quickly and effectively. Having worked with FSI authors and instructors, these courses have been fully tested through usage before release to the public. For over 40 years, Audio-Forum has been the original and most trusted source for Foreign Service Institute language courses.